This A. Jaffe signature diamond halo bridal set is elegantly crafted in the finest 18K white gold. Your Atlanta jeweler, Tara Fine Jewelry Company is home to a wide selection of A. Jaffe engagement rings and wedding bands for every bride to be. Prized for its intricate jewelry designs and remarkable attention to detail, A. Jaffe creates a masterpiece with this halo mounting shimmering with 68 round diamonds with accent diamonds channeling down the band, .29ct TDW. Complete with matching A. Jaffe signature diamond band in 18K white gold with 28 round diamonds, .18ct tdw. Come visit Tara Fine Jewelry, your Atlanta jeweler to try on this A. Jaffe bridal set and select your very own personal center diamond. (Center stone sold separately.) 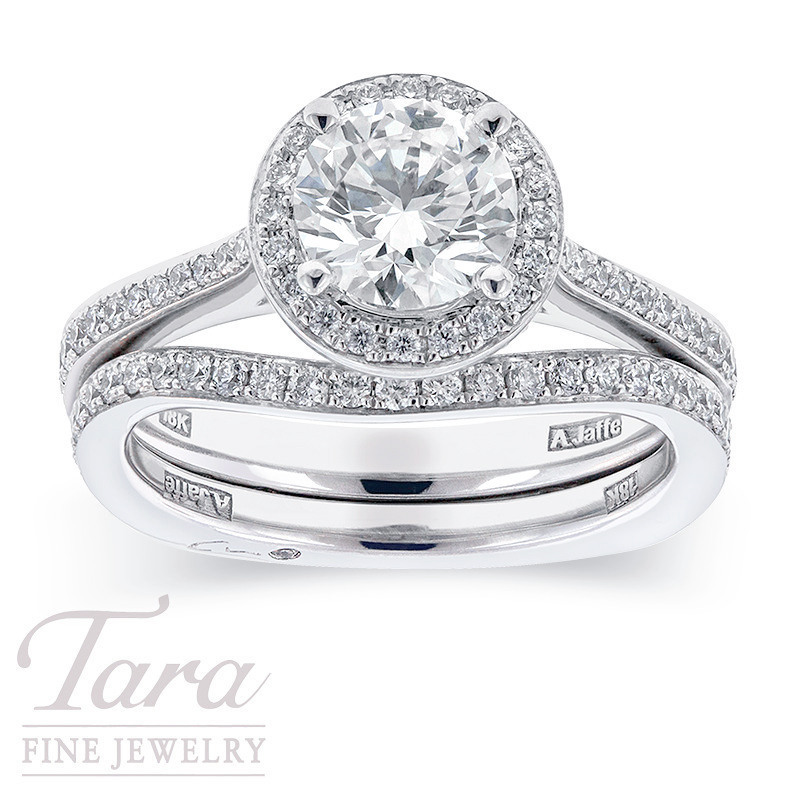 Tara Fine Jewelry Company is specially trained to guide you through the "4-C's of your diamond selection" so that you'll leave Tara smiling, knowing you have found your ideal diamond wedding set.